In addition to dried red and green chile, we offer a number of other food products of northern New Mexico. Click here to see our selection. Piñon -- (pine nuts) is the official state nut. We carry both shelled and non-shelled varieties. They can be purchased roasted or raw. Chipotle Powder -- The smokey flavor of chipotle gives many foods a new and exciting kick. Made from ripe jalapeño peppers that are seasoned and smoked, the flavor has an XHot barbeque essence. Also great in brownies! Salsa/Taco Mix -- This mix contains chile pequin, oregano, onion, garlic powder and preservatives. Use as a seasoning for soups and stews or as a rub for pork or chicken. Mix 1-2 t. with a can of tomatoes for a salsa. Local Oregano -- From Casados Farms. Chicos -- (shown above in foreground). 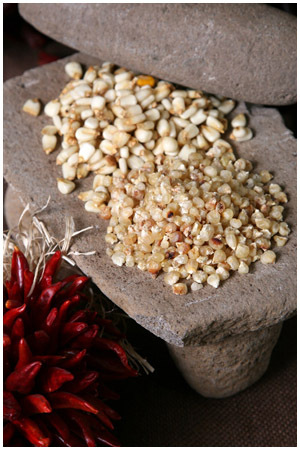 From Casados Farms these are small, tender, roasted, dry corn kernels. They are cooked with pinto beans or made in to a stew with pork, onions and garlic. Posole -- (shown above in background). From Casados Farms, posole is dried corn or hominy. Atole -- From Casados Farms, atole is toasted blue corn meal mixed with water and lightly boiled then served in a mug with milk and honey as a tasty morning cereal drink.